Museum accessibility has proceeded by leaps and bounds in a relatively short span of time. When I was working on chitons for my Masters Thesis I routinely made the pilgrimage to the National Museum, the Academy of Natural Sciences, the Museum of Comparative Zoology, and many others to examine material. Outside of the occasional loan or (God forbid!) an actual letter, there was no other way to get information out of a collection. This quickly changed with the advent of the world-wide web. Coupled with electronic databases, it was now possible for scientists to view catalog data without ever leaving the office. While in some ways this is unfortunate (every systematist should at some point visit these historical collections), the result was millions of records available at the touch of a keyboard. The OSU Division of Molluscs joined this effort early on by placing their freshwater mussel collection catalog online. The freshwater gastropod collection will be next to be uploaded for an estimated total approaching 2 million specimens – the largest freshwater mollusc collection in the world. But still, these are only records. How do you know the specimen behind the record is correctly identified? What color is it? In what condition is the specimen? Is there some unusual feature that might be of interest? Enter the next phase – the creation and uploading of digital images of the specimens, and associated labels. With the image(s) available online, now a worker can see nearly everything he/she would ever want to know about the specimen – again without ever leaving the office. Sounds great. But to the people who actually curate the collections this is a quantum leap in effort. Specimens must be retrieved, set up for imaging, photographed, incorporated into the database, and uploaded. 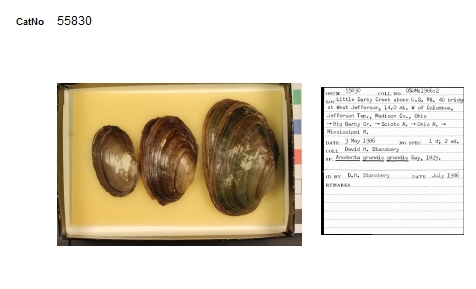 The freshwater bivalve collection is in this laborious phase of producing digital images of specimens. With over 90,000 lots to image, this will not be a quick project. To speed up the effort we image not individual specimens, but individual lots. Scale bars are included in the photo to indicate approximate size. Labels are also imaged. These are incorporated into the catalog database so that all information may be viewed online – collection record, locality map, lot image, and label image. In our version, a button on the catalog screen will take the viewer to the images. The upload of this digitized catalog is some ways off, but stay tuned. About the Author: Dr. G. Thomas Watters is Curator of Molluscs at the Museum of Biological Diversity. Posted by George Watters at 7:00am November 22, 2015 Posted in Biodiversity, Collections, Curation, Education and tagged database, label data, molluscs, photo, techniques. Bookmark the permalink.